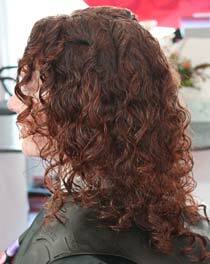 "Have Your Curly Hair Properly Cut & Styled by an Expert". had more than your fair share of hair cut disasters over the years. Being naturally curly myself. I’ve always taken a special personal interest in the methods and techniques used for precisely cutting and styling curly hair. As I know first-hand how important it is to do it right. 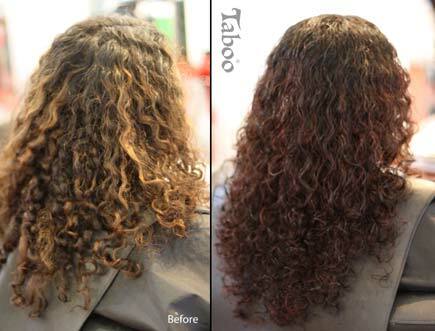 It takes a hairstylist who fully understands the unique characteristics of curly hair to be able to cut and style it correctly. 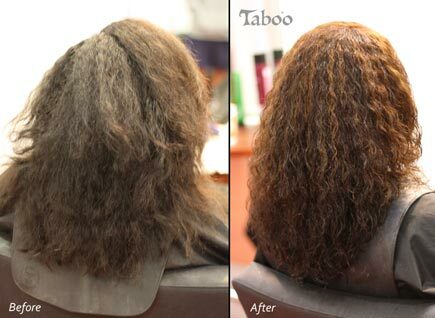 Its structure is completely different to straight hair and requires a different approach. The stylist must first assess the curl formation and take into account the spring factor (coil like properties) of curly wavy hair. The stylist definitely needs to be able to anticipate and visualize how exactly the hair will flow once its cut, with each individual curl needing attention. So that the finished cut and overall style has good shape definition and appropriate volume for the client. Cutting curly hair correctly isn't easy to learn. Many hairstylists will claim they can cut all hair types, but only a select few really know how to deal with curly wavy hair. 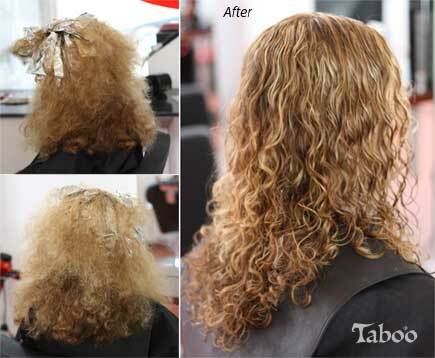 The above before and after photos is of curly haired clients who received a speicalised cut and colour service for curly hair with Tina Fox. recommend Tina - she's a top stylist and I'm glad I found her! "I am always very happy with the cut & colour here. "Tina is an extremely talented and professional hairdresser who actually does your hair the way you like it because she listens. I will continue to go there as often as I can and would definitely recommend her to other people." a director/owner of Taboo Hair Salon.